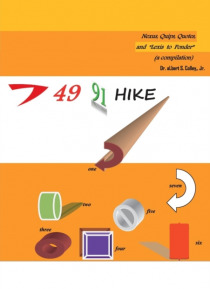 Whether you are 16, 34, 43, 61, or 70+; a student, craftsman, executive, or just deserve an enjoyable reading experience, you'll appreciate 7 49 91 HIKE: Nexus, Quips, Quotes, and "e;Lexis to Ponder,"e; a compilation of thoughts, quotes, a New York walk, etc., from the author and array of other individuals, known and some not as known. You'll encounter postings from Deepak Chopra, Howard S… chultz, Adyashanti, Steve Harvey, Ernest Hemingway, T.D. Jakes, Teddy/Franklin Roosevelt, Oprah, John/Robert Kennedy, Maya Angelou, Mike Tyson, Dolly Parton, Ru Paul, and many more. Postings excite thinking, discourse, and action by all who encounter its pages. The book is constructed around the magic number "e;seven"e;: 7-postings per page; 7-pages per chapter; 91- main text pages; 14-pages HIKE, a walk around Manhattan.